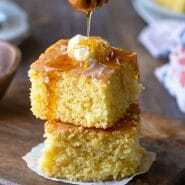 Best cornbread recipe! 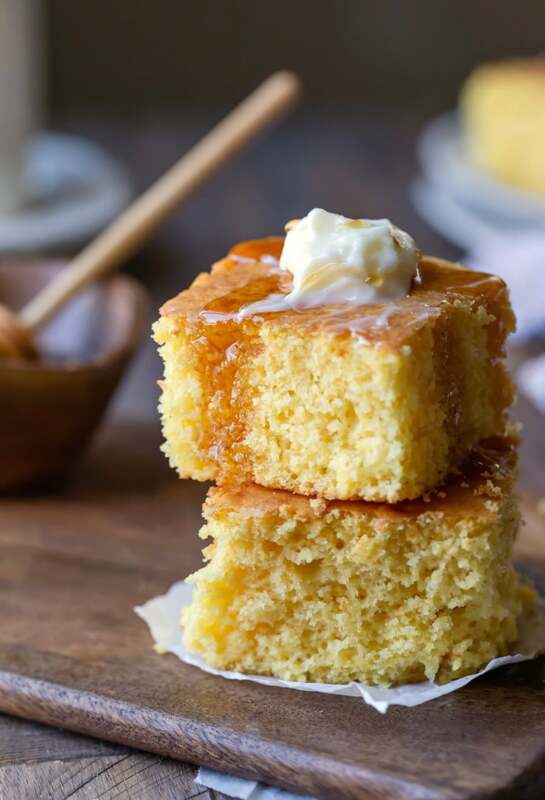 This sweet cornbread recipe is part cake mix, part cornbread mix for moist and delicious cornbread. I first had this recipe years ago when I was at Girl Scout camp, and I loved it! I’m a huge fan of both cake and cornbread, so combining the two suited me just fine. This cornbread is part cake mix and part cornbread mix. Simply whisk the two mixes together, add in the remaining ingredients, and bake. It’s that easy! That depends! I like to use yellow cake mix with pudding. The cornbread is a little moister and more cake-like. However, if you’d like it to be a little less sweet, try using a yellow cake mix that doesn’t have pudding in the mix. Anything from skim milk to whole milk will work in this recipe. If you go more toward the whole milk, you’ll end up with a richer cornbread. You can even use buttermilk in this recipe if you’d prefer. I store it, covered, at room temperature. I think it’s best eaten in the first two days after it’s made. 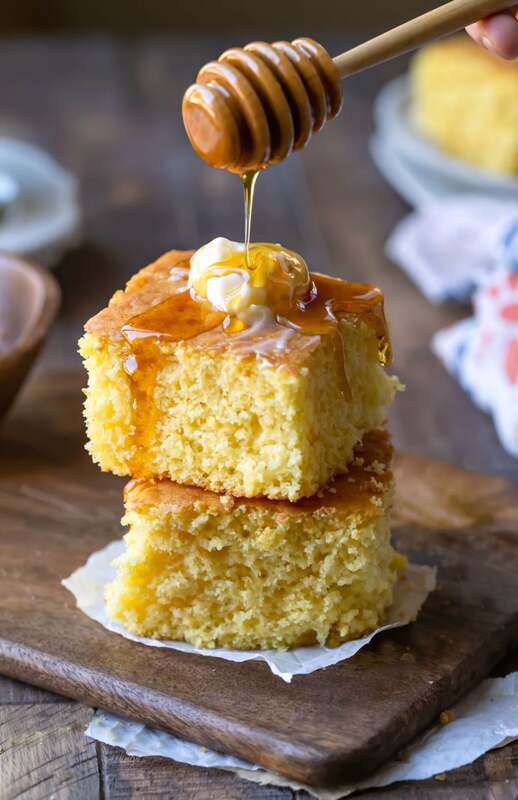 If you’ve tried this sweet cornbread recipe, don’t forget to rate the recipe and leave me a comment below. I love to hear from people who’ve made my recipes! You can SUBSCRIBE to receive my latest recipe newsletters or FOLLOW ME on FACEBOOK, INSTAGRAM and PINTEREST for even more delicious food. Grease 9x13 baking pan with nonstick cooking spray. Set aside. Whisk cake mix and corn bread mix together in a large bowl. Add remaining ingredients and whisk well to combine. *Yellow cake mix with or without pudding will work. **Any type of milk from skim to whole milk will work. ***Please see explanations above the recipe for more in-depth answers about substitutions and types of products to use. I have tried this recipe 2 times now and it just never seems to cook in the time recommended. I have used 2 different ovens a d still takes close to an hour and half to fully cook. Gosh! That is a really long time! I have been making this recipe for years and have also made this recipe using multiple ovens. I know ovens can vary, but I’ve never had it take anywhere close to that. Are you making any changes to the recipe? What type of pan are you using? I made this to go with your bbq chili, it was really good! My family likes sweet cornbread and this couldn’t be easier! Thank you so much! I’m glad that your family likes it. =) Thank you for coming back to comment.